People interested will be able to leave their tires in the Riteve station in El Roble of Puntarenas from Monday through Saturday 6:00 a.m. to 9:00 pm. From July to December 2018, 7 668 tires were collected from which 3 200 were changed by ecolones. 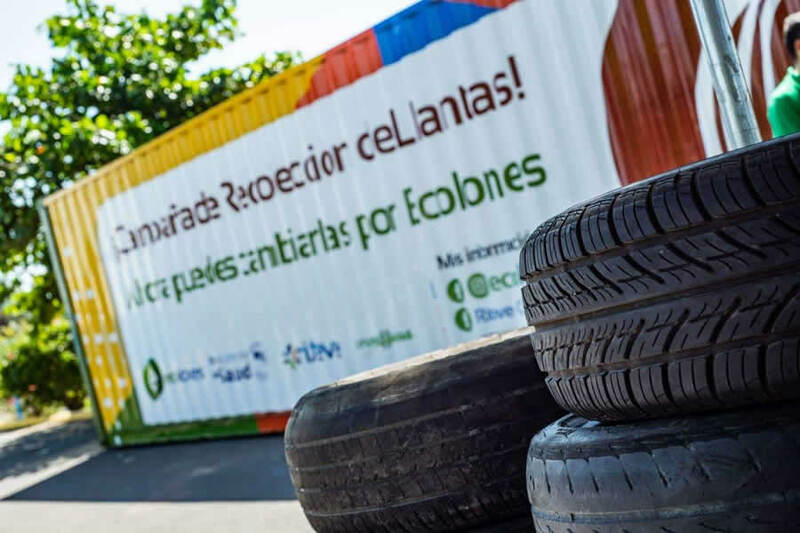 From this Tuesday January 29th, all residents of Puntarenas who have used tires can deliver them at the station Riteve in El Roble, in their regular schedule, thanks to the alliance between this company Fundellantas and Ecolones®, and with the endorsement of the Ministerio de Salud. Puntarenas due to its temperature and altitude conditions, favor the growth of the disease carriers, according to the figures from the Ministerio de Salud. At week 45 of 2018, there were 228 cases of Dengue, 37 of Zika and 15 of Chikungunya in the Central Pacific, being the second region of the country that reports more cases of vector-borne diseases with approximately 10% of cases nationwide. At the end of June of the previous year, this alliance started; in which the Riteve stations of Lagunilla of Heredia and Cañas in Guanacaste joined, where at the end of December 7,668 used tires were received and will be used by Fundellantas for the manufacture of llantiones in soil stabilization processes. Of those 3 200 tires that were changed by ecolones, citizens have also been able to take advantage of it. Another use to be given to this material is a volumetric reduction treatment for the production of substitute fossil fuel, alternative fuel that can be used by the cement industry. This alliance allows the collection and proper handling of used tires, while rewarding those who carry this valuable material, since they will obtain 100 ecolones® for each, to access discounts on the purchase of products and sustainable experiences at https://ecolonescr.com/descuentos/. According to Karla Chaves, director of ecolones®, the positive results that have been obtained up to date with these campaigns, show the commitment of people to correctly allocate this type of waste. “We invite the population to continue with the change and correctly dispose of the tires and avoid breeding mosquitoes that may affect the health of their families and communities”. “We are very proud to be able to give more and more options for the proper handling of waste tires, especially in areas such as Puntarenas, which are more exposed to the diseases they cause. We remain committed to the environment and the health of people and we hope to continue opening other alternatives in more parts of the country, always with the support of Fundellantas that has been vital and the incentive that adds to this effort the ecolones program”, commented Jennifer Hidalgo, Chief of Communication and Social Responsibility of Riteve. Elsie Álvarez, director of Fundellantas, commented that “through this permanent program we join the national prevention efforts, providing a solution in the collection and treatment of tires in disuse. We hope to turn Riteve Puntarenas into the solution for the disposal of waste tires in the Pacific and thus eliminate them as breeding sites for mosquitoes that transmit infectious-contagious diseases”.